All black cats do not look the same. | MEOW hear this! All black cats do not look the same. I love black cats. I don’t know why. I also love the color black. I’m not goth or anything, it just matches with things so well. And it’s slimming. Fatty, he lives with my mom, he’s rotund (as the name implies). He’s got medium length hair so he’s extra fluffy, and he’s got big, wide greenish-gold eyes. 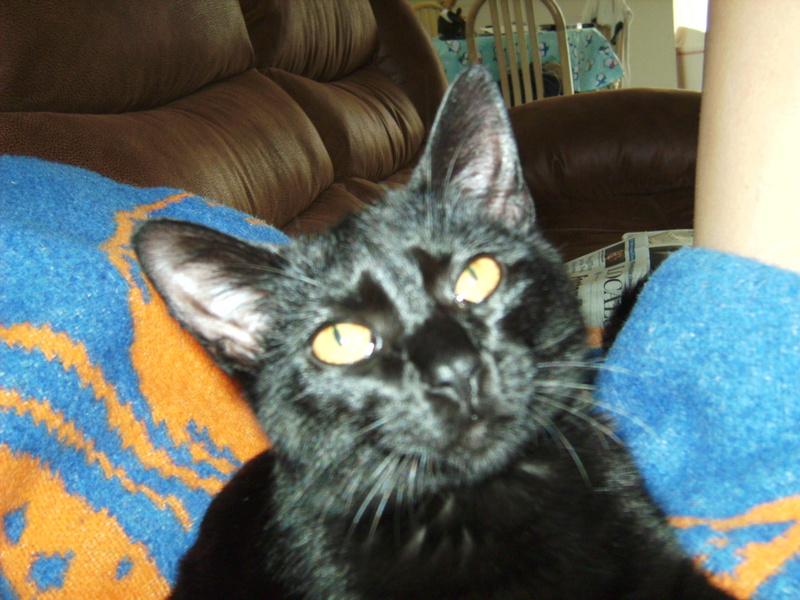 Jager, he was our little kitten that we lost to FIP (I always want to write about him but it’s too personal to a story for me to share just yet), he was wiry and had amber colored eyes. Moosh, he’s a big boy (like a panther, not like Fatty) and his eyes change color, but they’re mostly midway between Fatty’s and Jager’s. They all look completely different to me. When we lost Jager, the boyfriend didn’t want another black cat, because he felt like it would remind him of Jager too much. To me, this is like saying all girls with blonde hair look the same. That’s ridiculous. Moosh won him over anyway, so that was a moot point. When I talked him into a 2nd, I wanted another black one, but he thought it would be confusing. This is why we don’t have children. What if we had twins? Chaos would ensue. Also a moot point, because Taco came along, and although he has a black brother, I didn’t have much choice in the matter, because Taco was up for grabs, not his brother Zorro. 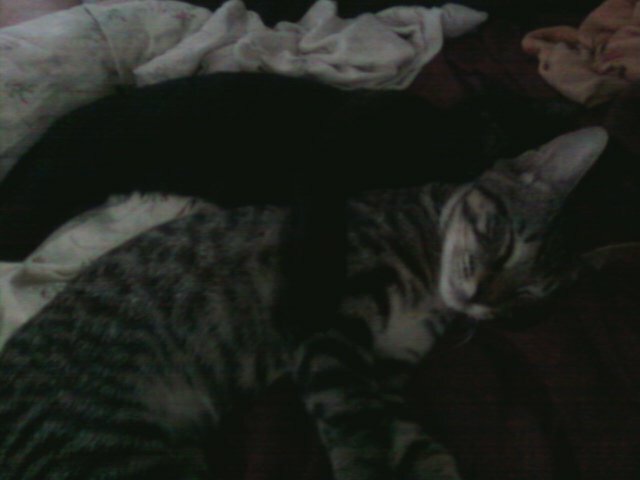 You can barely see Zorro, but that’s brotherly love. So because all cats have slightly different facial features, eye shape, eye color, etc., it greatly surprises me when I browse around other cat blogs to see pictures of kitties that look strikingly similar to my own. This is not to say I couldn’t pick mine out of a lineup. Moosh has one little fu manchu whisker on his chin and stray white hairs here and there that I know the exact placement of. Taco has a freckle on his head and a little one on his chin. I can usually even tell which one of them is sleeping on my feet at night, just by moving. Moosh is more bulk. Taco is more snake. He just melts into wherever he is. Last night I was out with some friends, including the one who gave us Taco. She still has Zorro, and the momma of the two. We often compare kitty stories, but her boyfriend hadn’t heard them before and was amazed to hear that they’re so similar even though they’ve grown up in two totally different environments. Granted, my friend is one of the awesomest people that I know and a fellow crazy cat lady, so I’m sure the parenting skills are on par with my own, but cats do form their own personalities so it is pretty interesting that their genetics have such an effect on them. They’re both loud, jump chest high and get into EVERYTHING. Zorro doesn’t pee on their couch though. I got the lemon. But lemon cats are my THING, apparently, so I roll with it. Sigh. This makes me want another black cat. This is so true! I have to say that my Bladie Poo looks a lot like your Moosh but I have a feeling he is stockier. 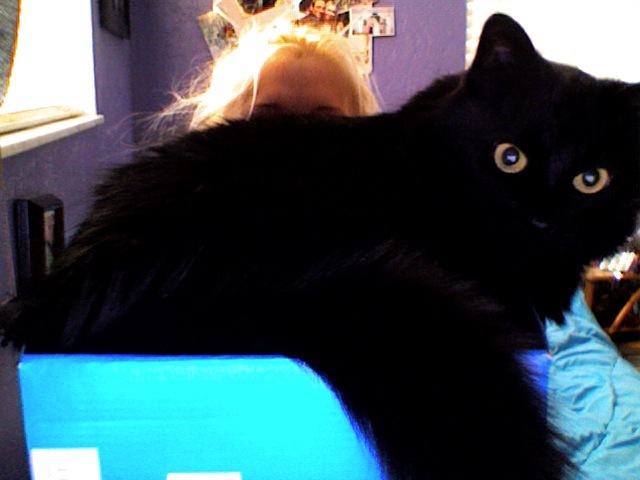 He is also a big 16 lb panther, all muscle and a major tom cat, although a major moosh himself. My pretty girl Tara looks more like Fatty. She is also medium haired and such a pretty cat. 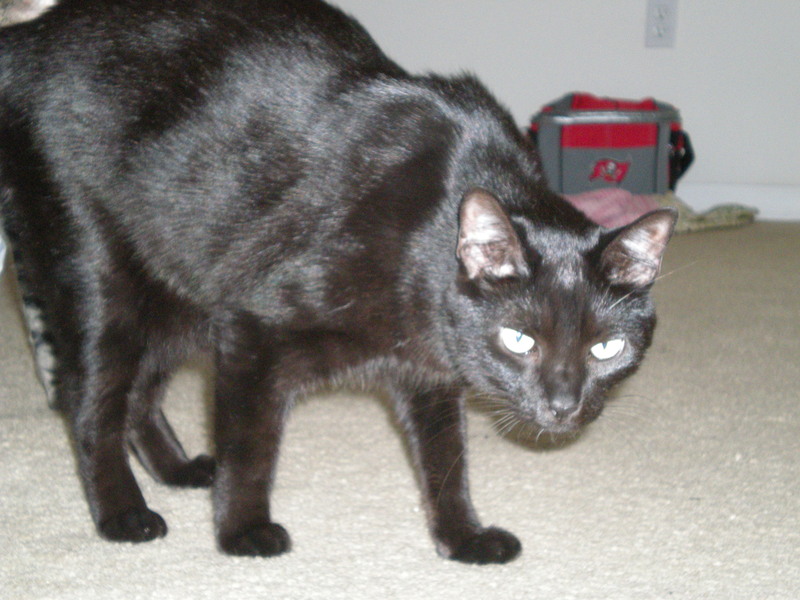 I have met several black cats just like Blade and they all have different faces and personalities – more than enough to tell them apart. I have to admit though, sometimes I think Julius is Blade until I see his white chin or legs because since they are nearly the same size. I have a bunch of big fatties. 🙂 Love them all the same! Moosh is a surprising 12 pounds, he looks (and feels) a lot bigger to me, and Taco is only a little lighter, even though he looks smaller. The different personalities are the best…I raise them all the same and they all turn out completely different. Love the quirks! Sometimes. Oh, none of them are “recent,” per se. Moosh has been with us for 4 years. We lost Jager a little before that, and the fat one, Fatty, he’s been my OG baby for 16 years. He lives with my mom, though. Cats in the wild? Nah, they’re pussies.